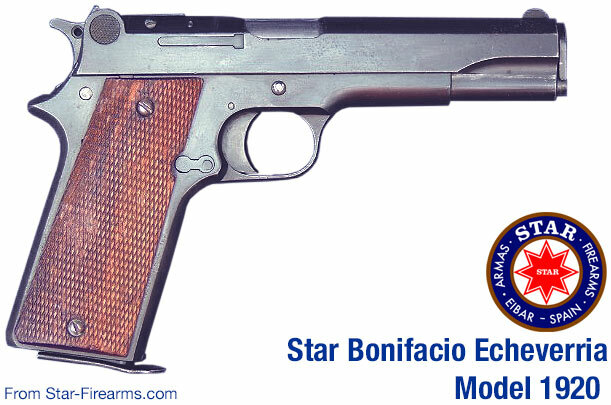 The model 1920 was the first pistol Star made more or less in the 'Colt 1911 style.' Although it has the general outline of the Colt and is indeed locked via a Browning-style tipping barrel and link system, there are a large number of other changes. Most of these clearly indicate that it was not an all new gun simply copied from the Colt-Browning, but that it was an evolution of their previous designs, and a true Star design in its own right. The pistol retains the rotating trigger and single (right side) transfer bar of the earlier guns and has a side mounted lanyard ring also seemingly identical to that on the 1914. The safety is an all-new rotating lever, mounted high at the extreme rear of the slide. The slide is notably tapered, so the safety lever is on a pronounced protrusion not unlike the shape of the Model-1 slide-cocking knob. Although the lever is only on the left side, the mounting boss extends across the slide to the right side as well. The safety lever rotates over about a 90° arc, forward to fire, and rear to safe. When on safe, the lever overlaps the hammer. This sort of design feature was common in firearms design during this era, using positions to not necessarily block access, but to remind the user that the gun may not be ready or safe to fire. While I have not seen the inside of one of these, the external shape of the hammer is identical to that of later Classic era Stars of all sorts. It is likely the basic fire control mechanism has now achieved final form, only lacking the frame mounted safety of later guns, although a pin in the frame also precisely corresponds to this. 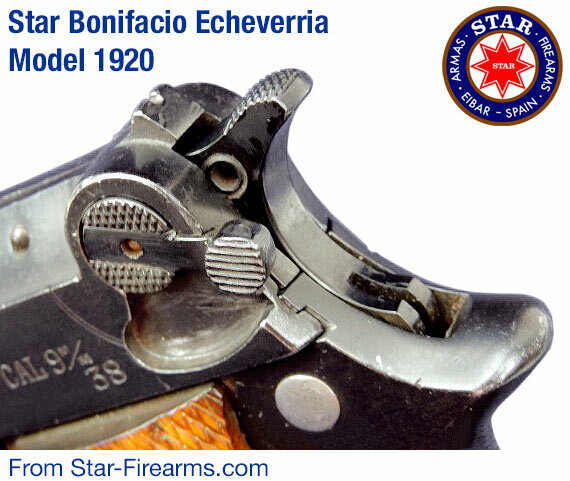 Other elements such as the barrel bushing are also very similar to later Classic series pistols, which many elements such as the general shape and extractor design are clearly not the same. Sights are quite large for the era, withh a deeply cut rear sight, and a typically-awful half-moon front but a very large one. All together, these sights should encourage good marksmanship, and also indicate the beginning of the Classic era pistols, of Star making handguns for gunfighters. Like the safety lever, and taking a cue from many other guns going back to single-action revolvers, when the hammer is forward it blocks the view of the sights, reminding the user that the gun will not fire. There are no manuals specifically about the Model 1920 or 1921 pistols, but later Classic-series pistol manuals should be close enough for basic stripping. The 1920 pistol was made in at least four variants, all of which were only made from about 1920 to 1921. The 9 mm Largo / 9 mm Bergman-Bayard version was used in small quantities by the Guardia Civil as a service sidearm. Subsequent models continued to be improved to meet the needs of the Guardia until the basic design of the Model A was settled on. Guns were originally chambered in 9 mm Largo exclusively. Reportedly, some or all were later modified slightly (re-cutting the chamber) to also accept the .38 ACP cartridge, and then overstamped to indicate this change. Hence, the offset ".38" stamp in the photos here. As a general rule, pistols marked 9 mm / 38 are designed to fire .38 ACP and 9 mm Largo ammunition, but NEVER .38 Super. Read more detail on ammunition for older pistols. Military models seem to have been parkerized, but it is hard to be sure with an 80 year old gun; other issue guns made outside of wartime are apparently brightly blued from the factory, so this may have been done at a later time, either by resellers or in a military arsenal refinish. Three "export" variants were also made, which means simply for commercial sale. All of these seem to be identical to the military model except for finish (bright blue with nice wood grips) and caliber, being offered in 7.63 mm Mauser, 9 mm Parabellum and .45 ACP. Though not impossible, I know of no specifically commercial variants in 9 mm Largo. 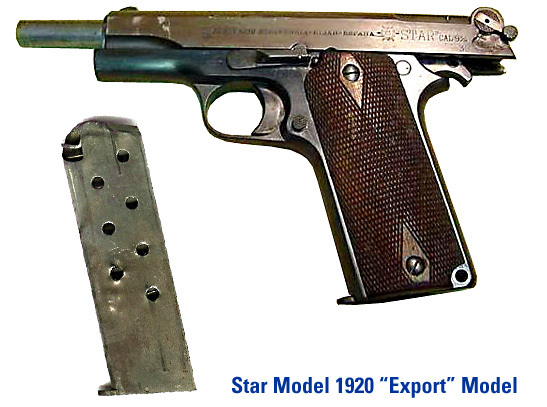 For anyone who wonders at the quality and longevity of Star pistols, reader Wally Koz still carries an original, unmodified model 1920 pistol (as seen the above photo) for his own defense on a regular basis in 2004.